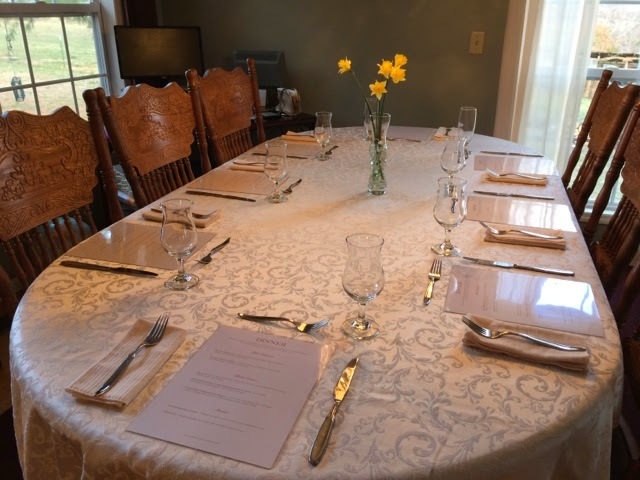 This meal was restaurant style with eight guests. 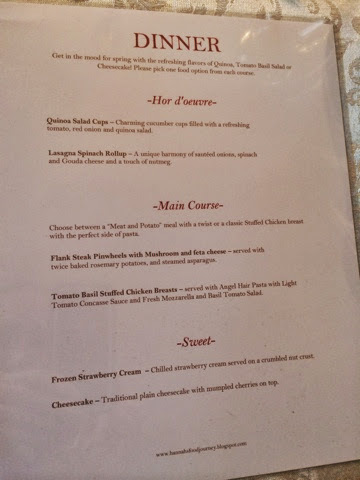 They got to pick which food they wanted for each course so in theory, it was indeed a three-course meal, but I was cooking twice that. It certainly kept me hopping preparing a "double three-course meal." Basil and sundries tomato stuffed Chicken breast, angel hair pasta with light tomato concise sauce and tomato fresh mozzarella basil salad. The entire meal went together amazingly after several days of hard focused work. It was a challenge to get everything ready at the right time when the meal was being served. Timing was so crucial and I learned SO much in the process. I am so glad I was able to serve that meal and I look forward to doing many more again soon. This was my first three-course dinner to ever make. I studied all the needed techniques (plus some) for every recipe and now have much more confidence in those areas. In order to be a good chef, one must be experienced. Through trial and error one learns their way through the tasks of life. I am so thankful The Lord has given me this time to learn from others around me!! Everyone has been such a blessing. I have decided that cupcakes should be my dessert specialty. They match my personality in every way. They are cheerful, fun, exciting and more versatile than ever imaginable! For my first attempt, I wanted to make carrot cupcakes. I know it isn't a typical batter, but that is my dad's favorite cake so I went with carrot. I actually didn't think they would turn out... but they did! 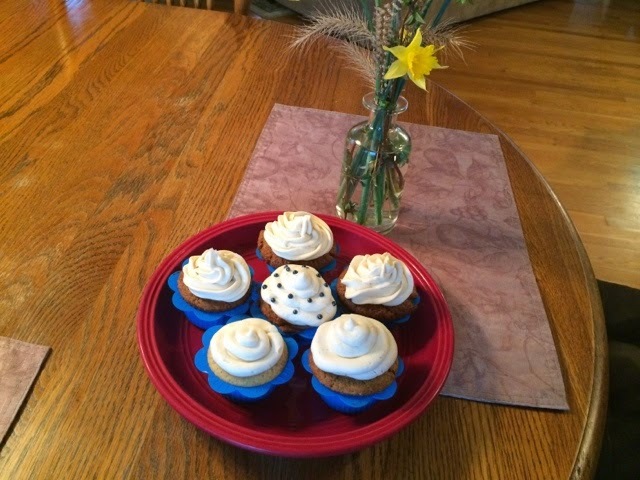 I made a simple buttercream vanilla icing and they were done very quickly. They are light fluffy and very cute. I really like the silicon baking cups, it makes clean up so much easier and cost efficient. Unfortunately, with only a few people... I can't be making dozens and dozens of cupcakes, I can only do a few at a time because we have so many leftovers. I really wanted to make vanilla cupcakes just to see how they would turn out the first time. I found a recipe for two cupcakes only. I thought that would be a good compromise instead of having to many. Just for fun I filled them with a cherry jelly after coring the middle and then put the same buttercream icing from the carrot cupcakes on top. The vanilla cupcakes turned out very satisfactory. Cupcakes are so much fun. I am so happy! I am looking forward to making more soon! 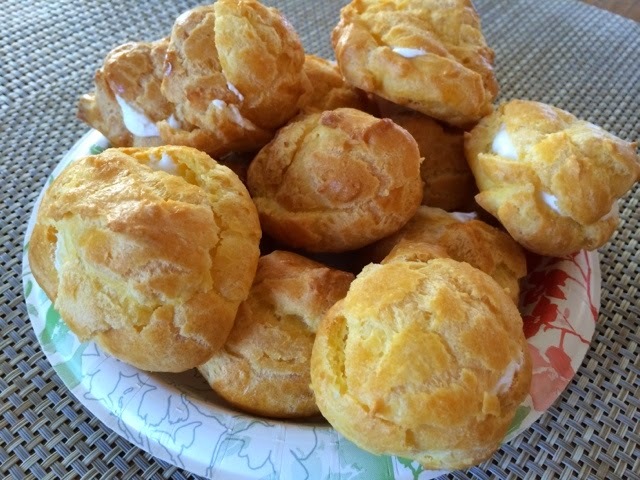 I just finished making Creme Puffs for the second time ever. This time I decided to make them a tad sweet. Since there is no sweetener in the recipie, I wanted the cream to have just a little sweetness to it. Adding just a tad of vanilla to the whipped cream after it had been whipped along with a little powder sugar did the trick! Now they are the perfect little dessert to accompany any dainty meal. 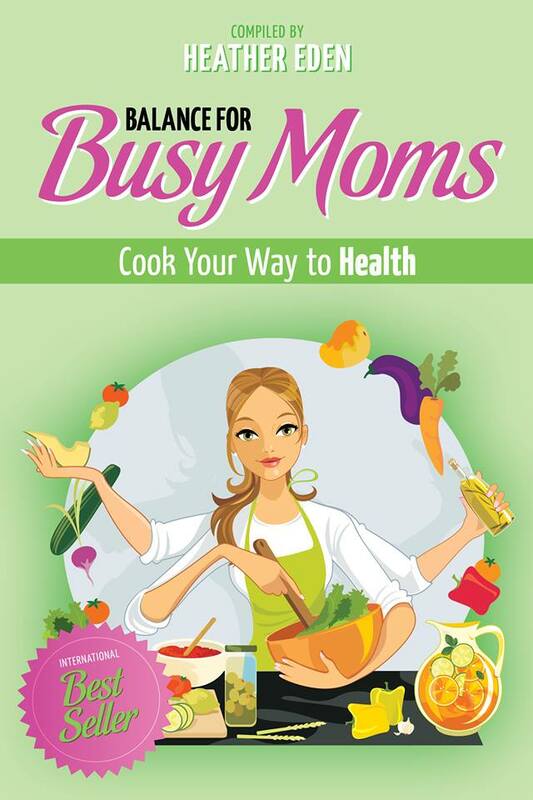 A person can cook all day in the kitchen and make a fabulous meal. I love doing that, but you have to take into consideration time. 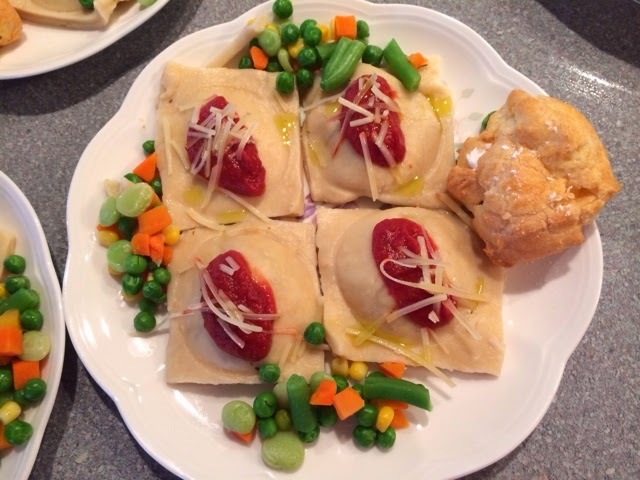 Making wonderful meals in less time is even more appealing because them you can spend more time with family. To make a challenge for myself, I decided to make four fajita lasangas in a short amount of time. Since duplicating a recipe isn't that hard, I knew it wouldn't take a ton of time. 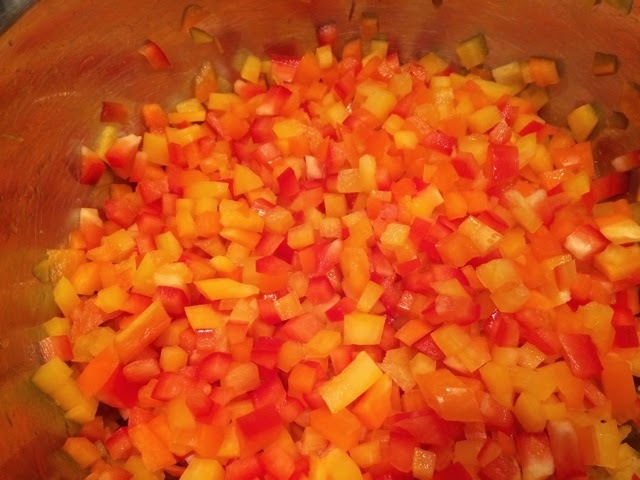 I knew the most time consuming part would be cutting up the nine bell peppers I needed so my quickening knife skills came in handy! After the lasangas were finished, I stopped the clock right at under an hour. It was a fast moving hour and I could have been moving more quickly, but I wanted to do a good job at the same time. It's nice to know I can make food that is yummy as well as easy in a short period of time. As I have said before, when I cook I like to use plain everyday ingredients and dress them up. 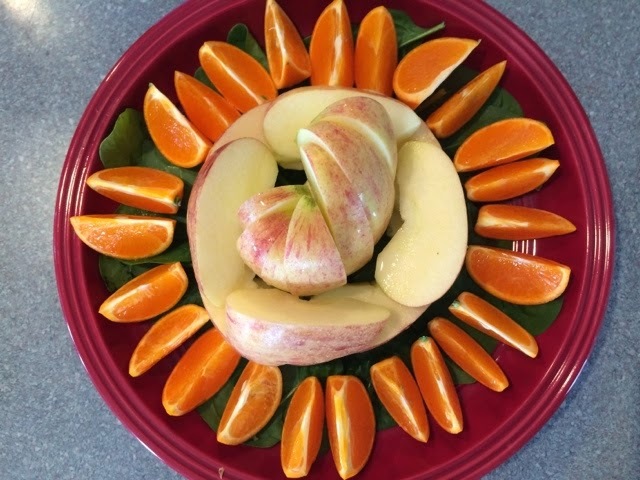 With just a few oranges and apples, you can make them look most attractive by just giving it a little thought. 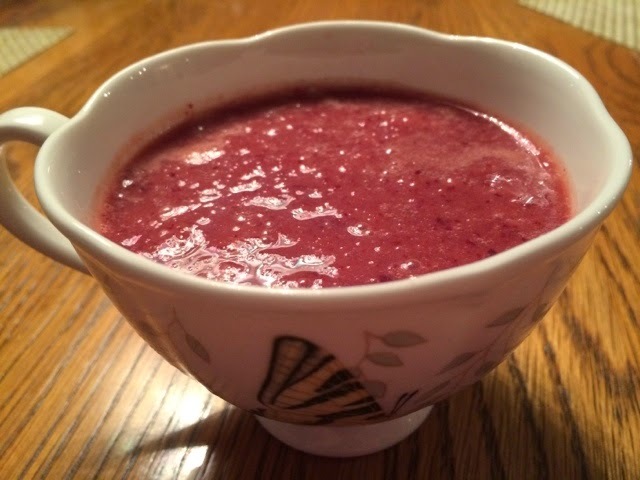 If it looks good, then people will be more inclined to eat their "fruits and veggies." 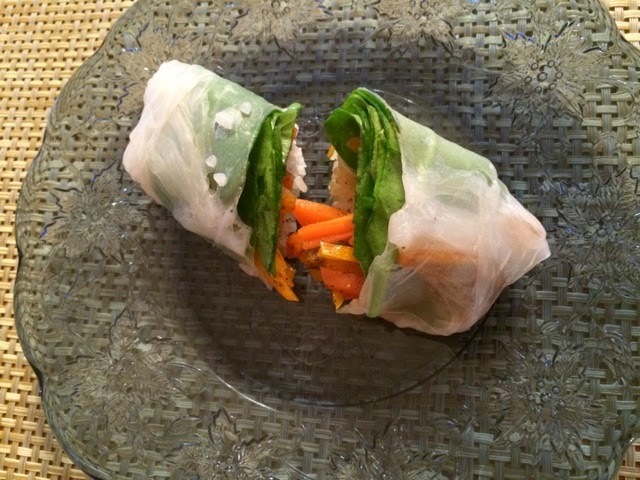 I had a blast making the spring rolls a few days ago, but I knew I could improve a lot overall with the technique. It is a tricky process to yet everything ready at just the right time before the rice papers become to sticky. I decided to give it another try, and instead of spring rolls, do sushi. Sushi has to be packed tighter, and stuffed with more color contrast. The rice also has to go all the way around the food. Thankfully this stabilizes the food better when you cut it open! To start, I cooked a salmon burger. Personally I don't really like raw fish a lot, so I went with cooked. After crumbling the salmon, I put the carrots in the fish pan just for a second. I chopped some spinach I had on hand, and my Mise en Place was ready! I found it easier to focus on a beautiful presentation by softening only one rice paper at a time. That way it was ready when I needed it, and the others like before didn't get to soft and sticky to soon. 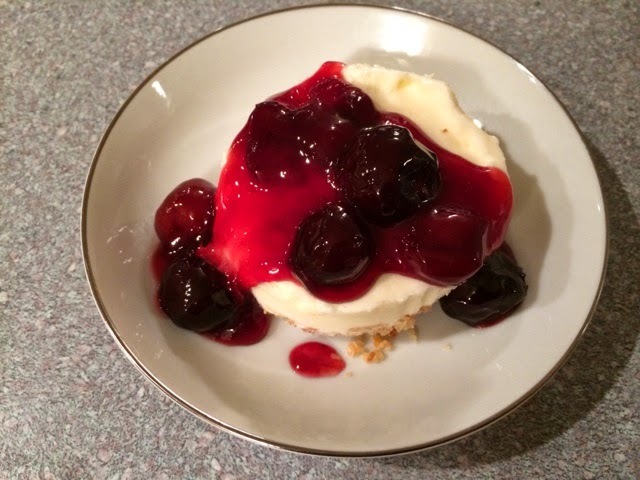 The final product was not only beautiful, but easy to eat and totally scrumptious. I ate these with just a few drops of soy sauce on them. I am really looking forward to making homeade sushi again soon!! I decided to try spring rolls. They didn't all turn out great. Now that I know how to use the rice papers that they get wrapped in, they will be better. Sushi rice, slightly balanched carrot, sliced peppers and spinach with an assertive vinigarete made up these colorful rolls. Finishing dinner I made a yummy sorbet out of Cheeries and lime. It was a great finish to a delicate meal. With the leftover chicken from yesterday's stuffed chicken breasts, I decided to make an Asian style something. First I made my popular chipotle honey mustard dressing with just a tad of soy sauce. Just the right amount of sweet, spicy and Asian. I toasted sesame seeds, put in the chicken, some green peas and salt and pepper. It was good. The perfect amount of balance is important, and though this dish was not really Asian, is achieved the balance I wanted. No plan... but dinner turned into amazing meal! Everyone was starting to get hungry and I didn't know what to make for dinner. With the refrigerator fairly empty, I resorted to my only choice for protien. Chicken. Carefully cutting the chicken breasts off a chicken I boiled yesterday, I slit them open and stuffed them with a cilantro, tomato, lime and Parmesan cheese mixture. Then I stuck them in the oven to warm up. Meanwhile, I pondered what else to make. I took the leftover cheese and spread it evenly on a cookie sheet and seasoned it with a bit of Cajun seasoning. Setting them on the top rack of the oven, I knew they would melt and brown into crispy tasty crackers. I boiled some pasta and made a simple but desireable mushroom sauce with a hint of lime. 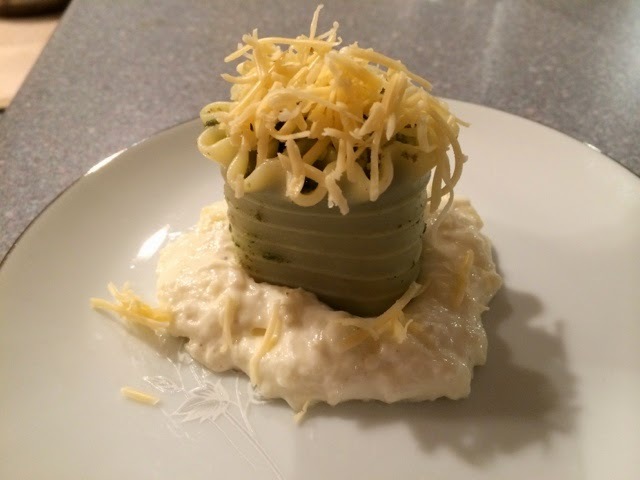 Milk was the base of the sauce, and it thickened up beautifully to sit on top of the pasta. After the sauce was salted properly, I pulled the crackers and chicken out of the oven and put together my impromptu dinner. It turned out wonderfully, and tasted better than any resteraunt meal you would had gotten. The stuffed chicken had a wonderful, moist and tender texture... not to mention the awesome flavor from the cilantro and lime! Presented beautifully, it came together very well. You can cook a meal that tastes good but doesn't look appealing and no one will really enjoy it. However, if you just take a few extra minutes... You can turn any dish into a beautiful fragrant dish by adding just a few simple garnishes. 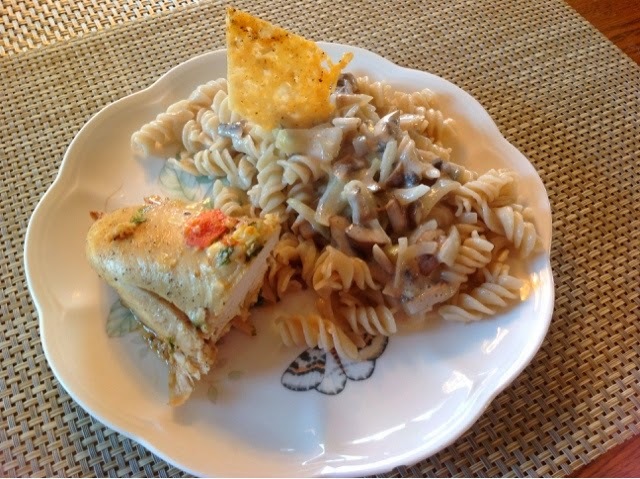 -Make sure you have a contrasting color and texture than the main foods on the plate. -Make sure it is something that will add to and inhance the flavor of the dish. -Always plan ahead and have your garnishes ready before the plate goes to the table. -take precautionary measures to insure that the garnishes on all the dishes of the meal are different. It doesn't look very appealing to have a spring of parsley on the steak, mashed potatoes AND vegetables. -Another thing you can do is cut or slice an ingredient of the dish a different and unique way that draws more attention to the dish. -Most of all... Get creative and be different!! 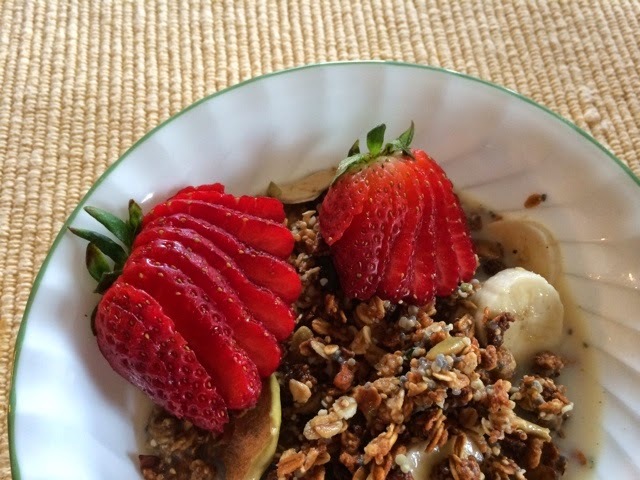 I dressed up a simple bowl of granola by cutting a strawberry in a decorative manner. Ta Da! 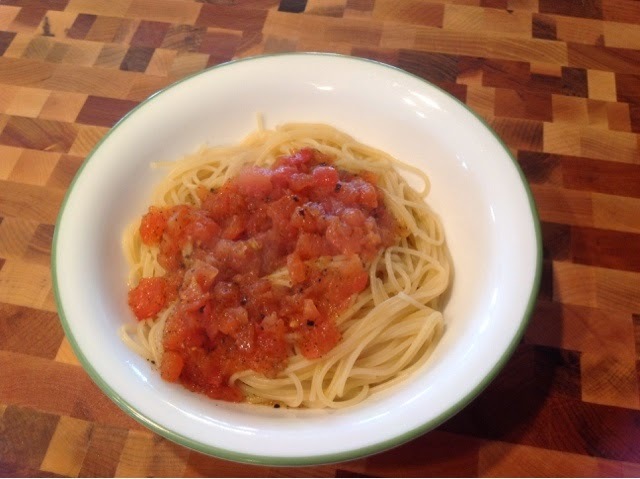 Today I made a simple but elegant lunch with Angel Hair Pasta with a light sauce. While the pasta was cooking in salted water, I made a tomato concasse sauce with tomatoes, olive oil, basil, salt and garlic. The sauce was perfectly cooked by the time the noodles where done. The tomatoes were not overcooked and mushy, but throughly heated and fresh tasting. The pasta was cooked al dente "to the tooth" and it had just the right amount of flavor from being cooked in the salted water. This dish made for the perfect light lunch. I will defiantly be putting this pasta as a side to a main dish in a three course meal soon! How in the WORLD do you organize a WORLD of recipes?? 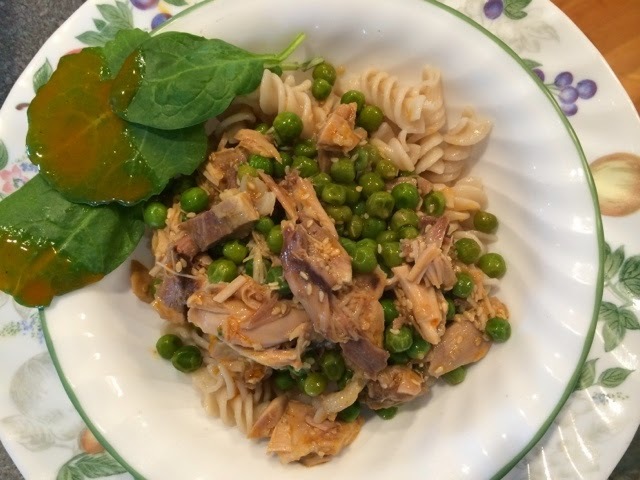 After spending many years with recipes in various formats and types, I had a dear friend recommend to me a website that organizes all your recipes, and not only that... It changes the way your kitchen functions. It does take a little while to get used to, but the amount of time you will spend UNORGANIZED, will amount to SO much more! 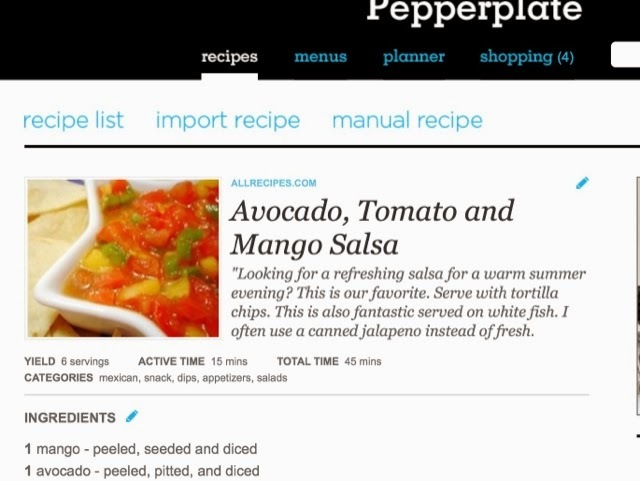 You can easily import your favorite recipes from the most popular food and entertainment websites out there with just a few clicks. 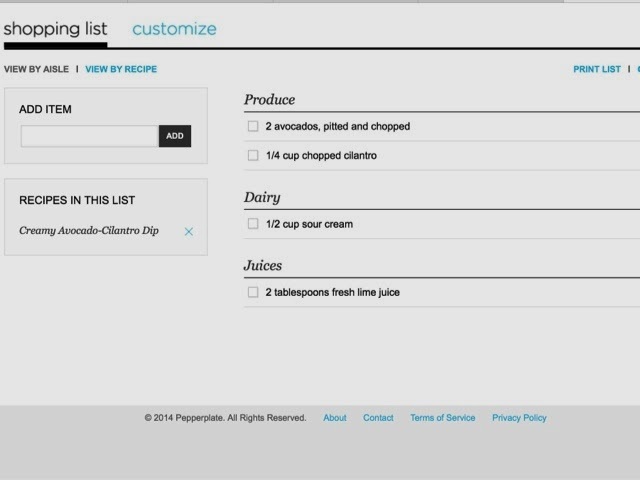 If you want to manually import a recipe, it is easier than you think! The best thing I like about it is that ALL of your recipes are in the same format and right there at any computer or techy device no matter where you are! 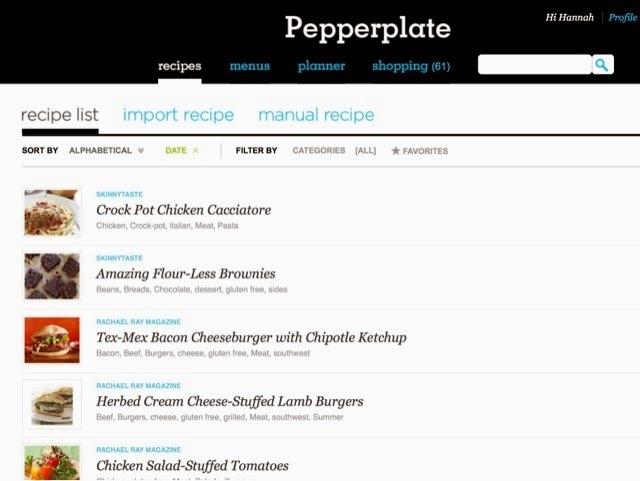 One thing that makes finding a specific recipe your looking for easy is the tab feature. Let's say that I am importing a chicken enchilada recipe. I would want to categorize it into something like chicken, cheese, Mexican, southwest, summer, etc. I try to make as many possible categories as possible because that gives me more search results later when I am trying to find that recipe. That way if I don't remember the technical name for a dish, I can still find it by searching for "Mexican Chicken dish." All you have to do is click to add it and title your menu. If I want to make a Light Greek Lunch, then I add that menu to my shopping list, and I have a list of ingriedients right there on my iPhone telling me exactly what I need for my salad, olive dressing and flatbread. With this simple system, I always have just what I need and nothing wasted! Here is a shopping list organized by store section which makes going through your local superstore even faster! It saves me so much time. If I want to half a recipe, then I hit the 1/2 button and all my measurements recalculate. I can even triple the recipe or more! 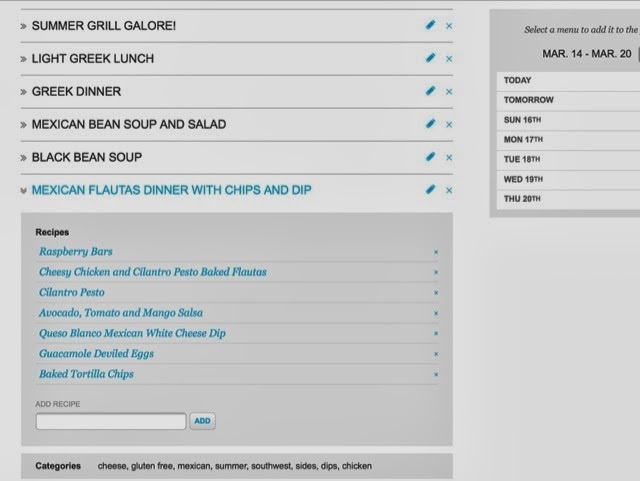 You can even easily share all your stunning recipes via email Facebook and many other media channels. 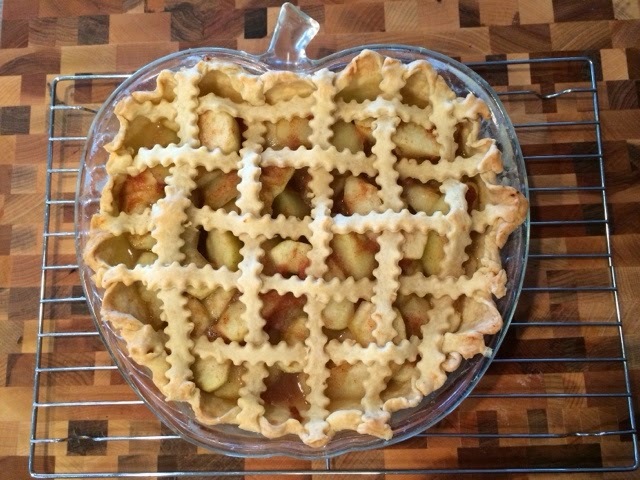 In observance if National "Pie" day, I decided to try my hand at a "Lattice topped Apple Pie." I suppose it turned out all right... It looks wonderful, now I just have to taste it. 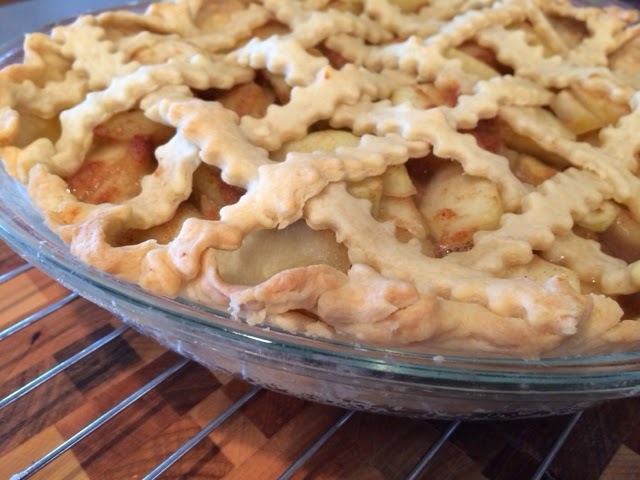 Thanks to my mom for supplying the home-canned apple pie filling she made last summer, I just had to do the crust... It doesn't get easier than that!! 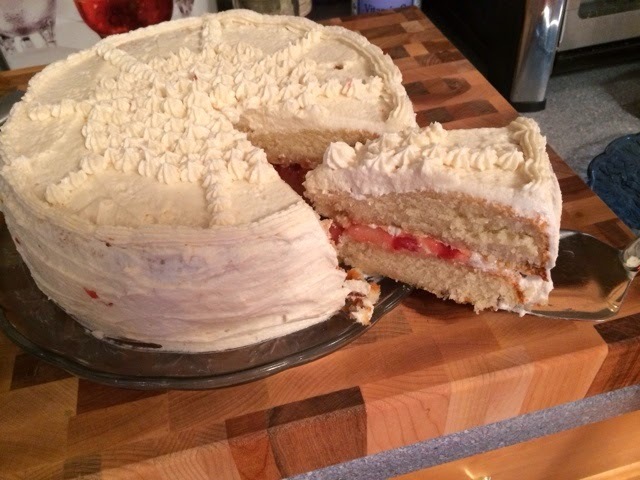 Just because, I decided to make a white cake. Because my dad doesn't like chocolate, I decided to dress up a two layered white cake with strawberries in between the layers and lime frosting. It was a perfect balance of sweet and acidity. Yum! 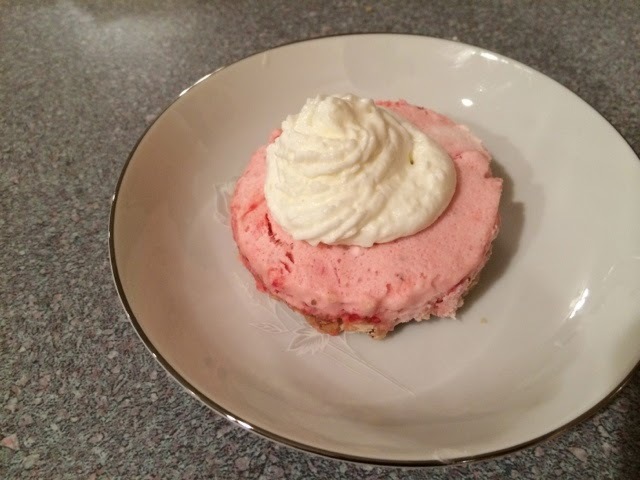 It was almost like strawberry shortcake. I hope I have a special occasion to make a cake for soon! I got adventurous yesterday. 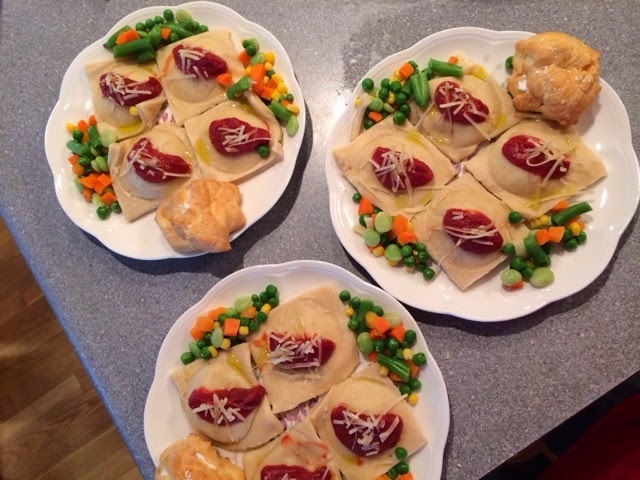 I decided to make homemade ravioli. It really did turn out. It was stuffed with ground turkey in a tomato basil thyme sauce. Rolling out the pasta dough by hand was quite an undertaking, but it was worth it. 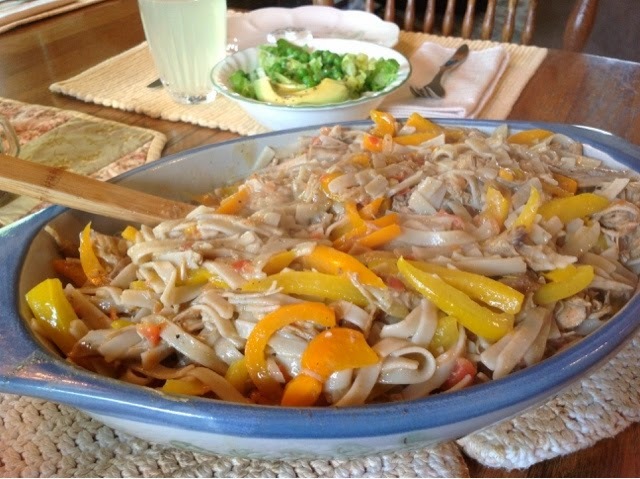 But before I add homemade noodles to a weekly menu, I think it would be nice to get a pasta maker. On the side of each plate is a cream puff for dessert. I do this from time to time and I thought you might enjoy trying it. 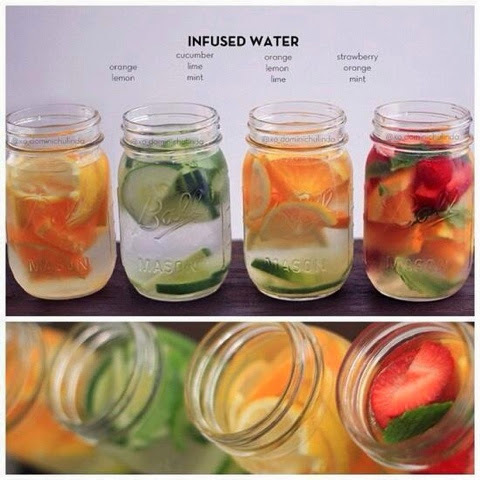 My favorite combination is to put some fresh strawberries and a few mint leaves in water and let them refresh me during a hot summer day. I will have to try adding orange in next time. Any fellow Catanians out there? I have been wanting to make this taco tray for a while... 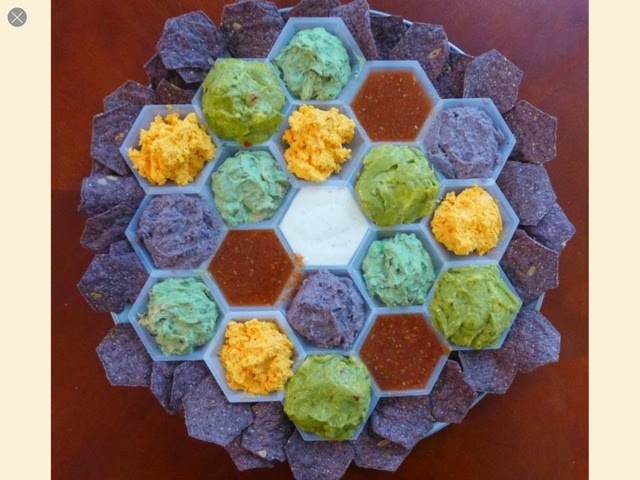 I will have to have some friends over for a Catan game night just so I can make this fun and lively tray. 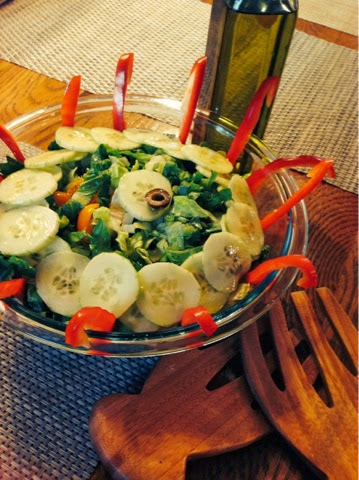 Another beautiful raw salad that is perfect for any light lunch. A cabbage salad with corn, fresh parsley and cracked pepper is delightfully crunchy and the corn sweetens it just to perfection. This cabbage salad is almost a weekly dish in our summer menus. Here is a simple but beautiful spinach salad. I enjoy letting ingredients show themselves off without altering them to much... Especially when they are fresh out of the garden! I wish I knew this before!! I wonder if this really works? If it does... 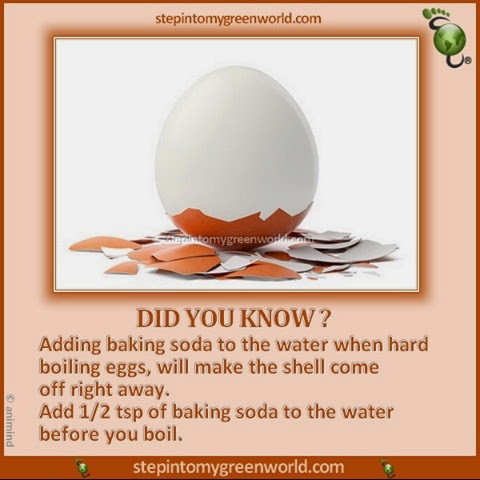 I will never forget to add in baking soda to my boiling water again! 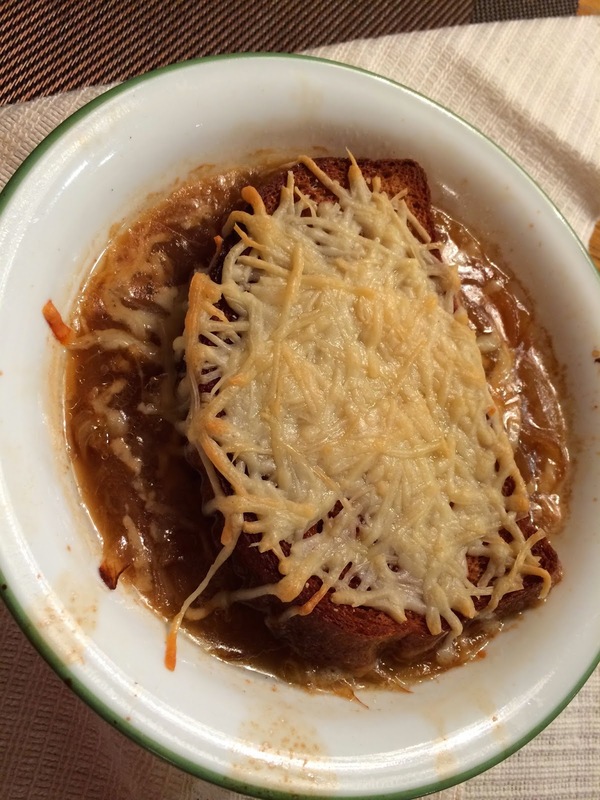 One of my dad's favorite meals is just a hot bowl of French Onion Soup. I decided to make it one night with some homemade chicken stock. 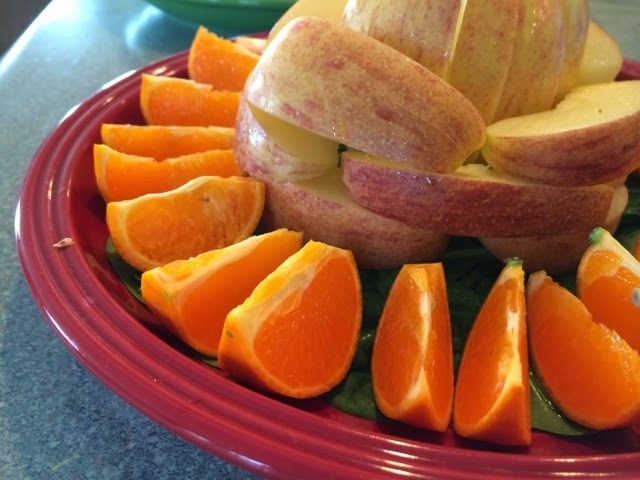 Last month, I was asked to make a fruit bowl for a friends baby shower. Immediately I remembered that I had been wanting to make a strawberry chocolate edible creation. I put this together in just a few hours with the help of my wonderful sister, and sure enough... it was a great centerpiece. It was almost to pretty to eat, but by the end of the day the whole thing had been eaten! A week or two ago, I decided to pull out a recipe that I had never actually gotten to try but had been sitting on my to do list for a while. Cream Cheese Stuffed Herb burgers. They sounded delicious. They turned out wonderfully. The cream cheese herb patties that I made and put inside the burgers kept them nice and moist while they were cooking. 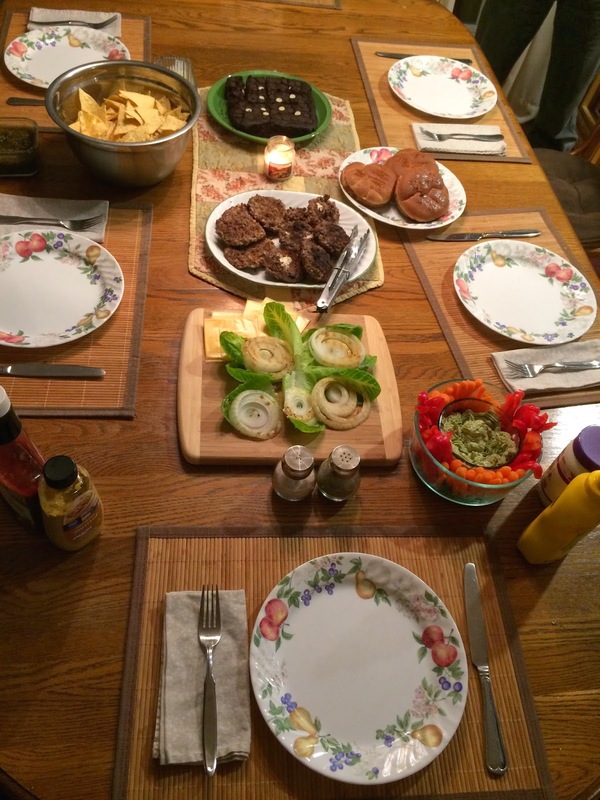 On the table along with the burgers are black bean brownies, seared buns, red peppers around guacamole and lettuce with fried onion ready to go on the buns. I will definitely be making these burgers again soon! Today I decided I wanted something a bit different for breakfast. Not just the usual egg fried on a plate. I like choosing typical ingredients and doing something new and unexpected with them. 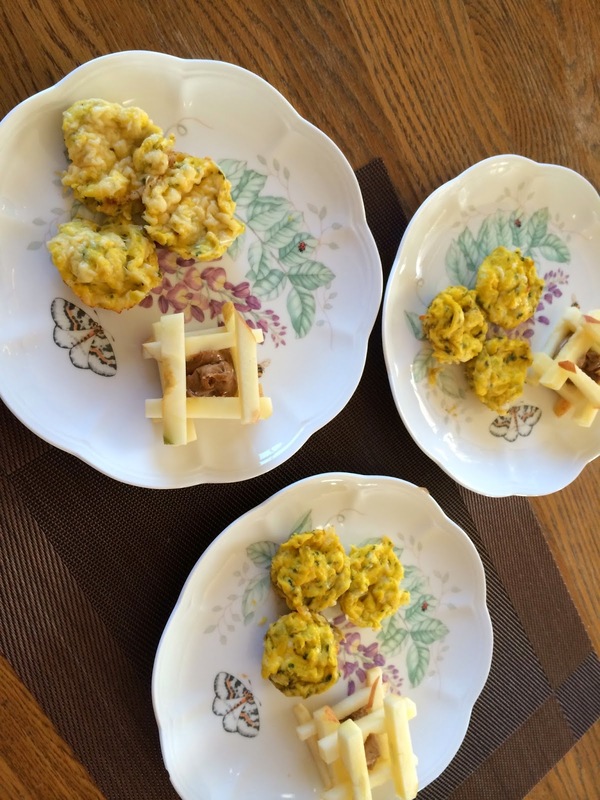 I came up with these egg muffins to go along with a bit of sliced apple with almond butter. Surprisingly it was all very good and quite filling. The muffins are something i used to make just in a bigger size. I still haven't mastered the technique to keep them from falling. In the oven they rise to a beautiful height, but as soon as they get out of the oven they fall. I will keep trying... any tips or ideas? 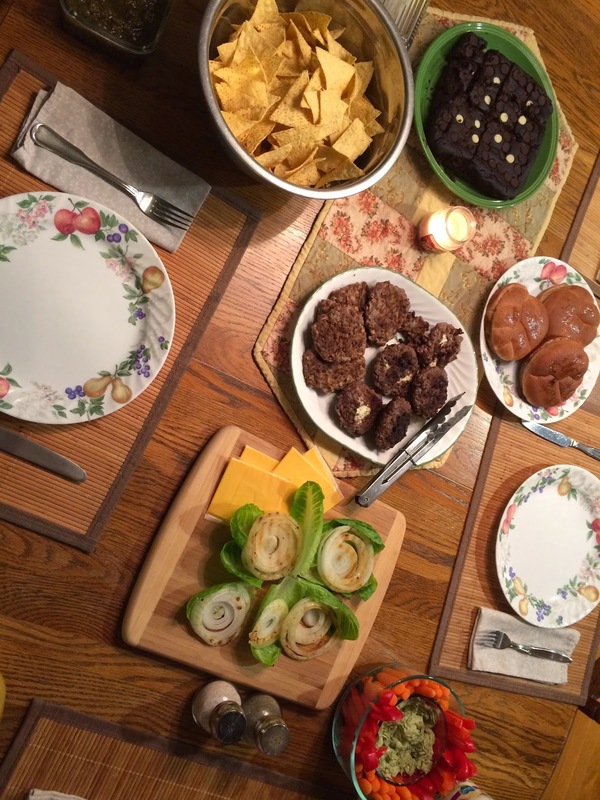 Recently a friend and I decided to give it our best to cook for a crowd of 17 people. It was quite the undertaking since I had never made any of the recipes we made except one. My day started out Roasting a chicken which I had never done before. It turned out pretty well, but I know now what things I will do differently next time I roast my favorite fowl. After roasting the Chicken I boiled eggs which believe it or not was also a first. I am learning a lot! The final finished product of the eggs were very satisfactory. They were perfectly seasoned with the lime and cilantro. Instead of the typical seasoning on top, I put just a sprinkle of cajun seasoning on top for just the right amount of bite. Next I decided to go ahead and make the black bean brownies. They are super easy and yummy. There is no sugar in them and no flour, so they make the perfect treat to the person eating gluten free and / or sugar free. This time I thought I would give them a bit of a twist by making them in a small cupcake mold. They were cute little bite sized brownies! After finishing up the meal by making the cilantro pesto, spreading the flautas with the cilantro pesto and stuffing them with the chicken we baked them. Here is the finished product with Cheesy Chicken Flautas with a Guacamole Picnic egg and just a bit of Queso dip drizzled over the chips. I must not have gotten a picture of the Avocado Tomato and Mango salsa, but it was in small dishes scattered by each guest. Overall... the meal came together really well and all the guests enjoyed the meal... all 17 of them!! Popular Black Bean Brownie Recipe and 59 other easy healthy recipes inside! Crock-Pot and Sous-Vide... does it work?